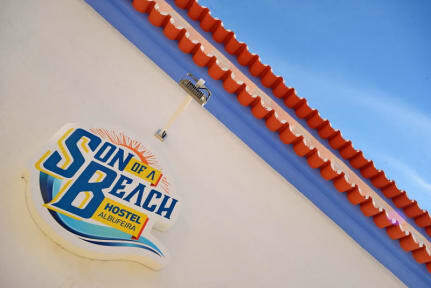 Son of a Beach Hostel i Albufeira, Portugal: Reservér nu! Welcome to Son of a Beach Hostel.At our reception you can inform yourself and purchase tickets for a variety of excursions and tours available. There is a bit of everything from the excursions to discover the culture of our people or the very popular boat trips to see the caves and dolphins and for nature lovers, kayaking through the caves or surf circuits and SUP .There is also free WiFi throughout the hostel 24/7.The Son of a Beach Hostel is located in the heart of Albufeira in a typical building of Algarve totally renovated and adapted to offer its guests the maximum comfort during their vacations it has a kitchen equipped with everything you need to cook and enjoy your meals, also has a living room with TV, an outdoor lounge.Whether for a day or more, come live like an authentic Son of a Beach. Hostel very well located in the centre of Albufeira, 2 minutes walk from the beaches of Peneco and Fishermen. It is where everything happens, but in a quiet area with shops and restaurants in front of the Hostel and a supermarket 50 meters away. 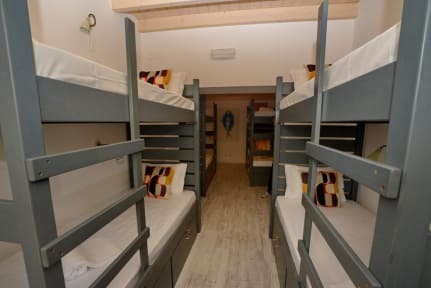 The Son of a Beach Hostel has four shared rooms with Bunks where all beds have their own light, individual lockable drawers and shared bathroom with bath or shower. And two suites with private bathroom.